Fret Tek recently had the opportunity to do the Plek setup for Kenny Burrell on his brand-new Heritage Signature Super KB Model. Upon arriving at Fret Tek I asked Kenny when was the last time he played an $18 guitar, and thrust into his hands exactly that-an $18 guitar that had already been Plek' d. After a few moments of Kenny's amazing "noodling” he pronounced the guitar "perfect in playability." That's what Plek can do to virtually any guitar. “I have found that it's an easy way to get people's interest. Looks and sound are player subjective, but how they feel and play are universal." The Heritage Super KB guitar that was brought in, initially had too much relief (95% of all guitars that I've scanned have excessive relief. Go figure.) and had some extra height at the nut, but basically had the correct action at the 12th fret. The truss rod was adjusted to a Plek profile, corresponding to the optimum in relief based on string gauge, scale length, etc. 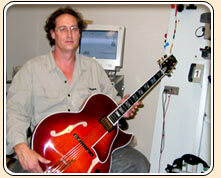 I first scanned the guitar, strings on, tuned to pitch with a targeted action at the 12th fret. (This action setting corresponds to one of Kenny's other well-known guitars.) A projected Plek profile appears on the screen - the green line indicating the Plek targeted profile and the red line being the actual measurements of the guitar. It showed me graphically what the neck looks like under tension, viewing each string/path separately. Plek measures to 1/1000 of a millimeter - the relationship of the fret top to the fingerboard, the string spacing, and the action at the nut and at the 12th Fret, while calculating correct relief for each custom action setting programmed. Truss rod adjusted, the next scan provides a virtual fret dress window that allows me to customize the fret dressing process to each individual player's needs. With the virtual fret dress performed, the strings are pulled to the side of the guitar and the Plek now dresses the frets in compound radius, checking itself against what the guitar looks like under full-string tension. (This is where man and machine part ways! The differences between the tolerance of CNC and a guy with a file and a rocker, and maybe a crowning file are vast and very much noticeable in playability.) Plek, in perfect compound radius, allows for such things as different elliptical patterns for string gauges with a much "flatter" fingerboard i.e. less relief. It is even possible for Plek to carve some relief into the actual fret tops for better playability and action on the bass side. After the Plek process Kenny, while playing another guitar, was handed the Plek'd Super KB Model that I had just finished for him. After playing a few chords, he requested that the former guitar be set up the same. One of the things that Fret Tek and Heritage will be working on in the future with Kenny is to compile all the statistical information about Kenny's setup, to be made available on his Heritage Signature Models. 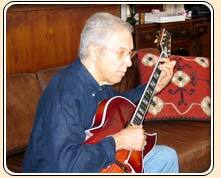 So stay tuned for further tech talk about Kenny Burrell and Plek. As of Jan, 2004, Heritage Guitars has come on board with the perfect setup with Plek technology by now pre-Plekking all Heritage models out of their Kalamazoo factory. So we, at Fret Tek, have a special offer for all non-Plek'd Heritage owners, guitars made pre Jan 2004, for the Plek setup.